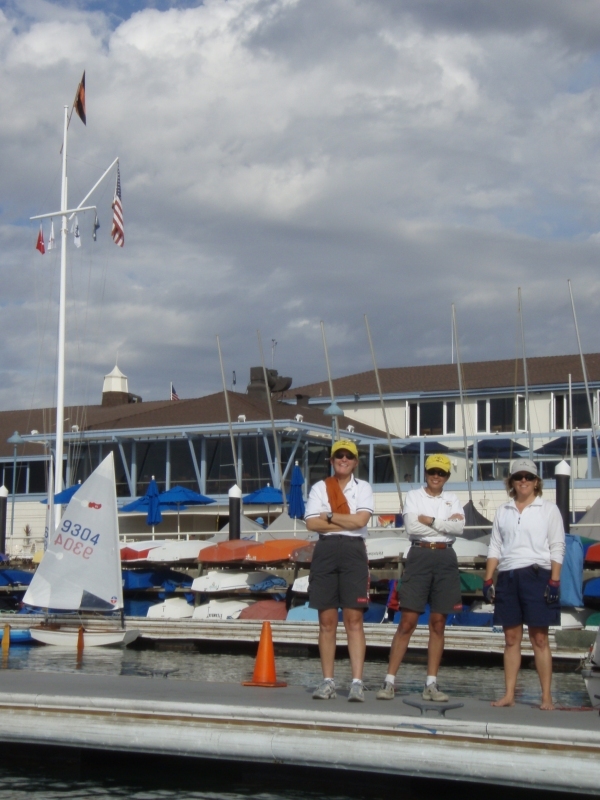 The first day of the Sunkist Series has also been used as a fundraising event for the Children's Hospital of Orange County (CHOC) - the CHOC Regatta - for several years. Sunkist Series entrants have the choice of sailing just the Sunkist Series or donate to CHOC and be scored in the CHOC Regatta too. Racers encountered a combination of extreme tides, light winds, slightly overcast skies, and warm temperatures. In other words, standard Sunkist conditions. 5 feet tidal changes are considered very big here in Newport Beach and the currents that come with them can and do dominate the strategy of winning at the Sunkist Series. Today's 5+ foot tide started changing late in the morning and continued thru about 4pm. Meaning that the peak tidal flow was smack in the middle of the day when we were racing. With an outgoing tide and a normal south-westerly wind, the normal strategy is to seek relief from the current by sailing towards the shallower waters alongside Balboa Island. It's a rather confined space to operate in as immediately adjacent (i.e. about 3 or 4 boat lengths away) from the docks lining the shores of Balboa Island is a sizable yacht mooring field - full of yachts! So you end up weaving your way thru the mooring field, getting to the clear water right next to the island, and then roll tacking yourself silly for quite a while. Of course this is all in very light winds - puffs to about 6 mph. Below is a wind speed graph for the day. Racing was between 1:00 and about 3:30. Ouch. 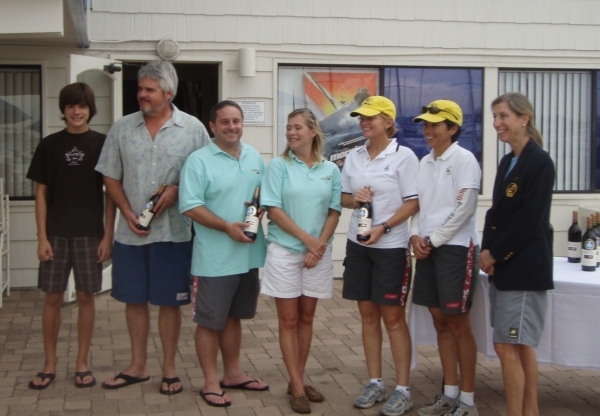 The Sunkist Series is a multi-class regatta. Harbor 20s, Thistles, Lasers, Lido 14s, and Sabots are the customary classes. The Lido 14 fleet starts 4th in the sequence so it often catches up to the fleets ahead. Imagine trying to pass the back end of the Laser fleet while sailing up this narrow "channel" next to the island - it takes a bit of tactical savvy and luck to not get messed up somehow or another. Of course some folks just simply stay out in main part of the bay where there is stronger current but possibly better wind - and only the need to tack occasionally. Sometimes staying "out" works wonders. The team of John Papadopoulos and Christophe Killian punched out to a bit of a lead at the start and led the fleet through the mooring field to the "channel". But the teams of Walter and Terry Johnson and Bob Yates and Pat Kincaid were pretty close behind with Ryan & Nancy Davidson really close at times too. As some point Walter was able to pull out in front. Then John got into a minor right of way tangle with a Laser and fell back a few places due to spinning his penalty turns. But that also forced John out of the channel and into slightly better winds that allowed him to catch right back up to where he left off - and the whole shootin' match sort of started right where it left off. The next big play was John passing the boats ahead of him on the way downwind to the next mark and then extending his lead to 8 or so boat lengths as the race wore on. Racing was postponed after the first race while the wind took a siesta. A gorgeous day to be outside. 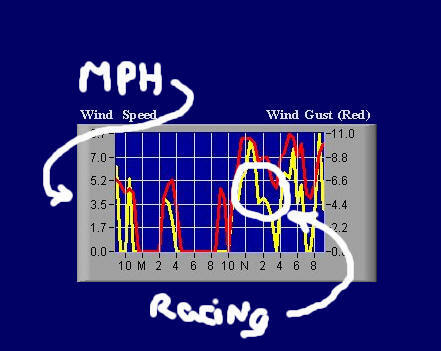 An attempt was made to sail the second of the two scheduled races but the wind velocity was darn near zero. The lucky boats got about 100 yards (i.e. from the start line to the nearby "K" mark) only to come to a halt when they tried to round mark K and sail into the current. The race was abandoned. Rare is the case where you can't sail upwind and the second race was just that. 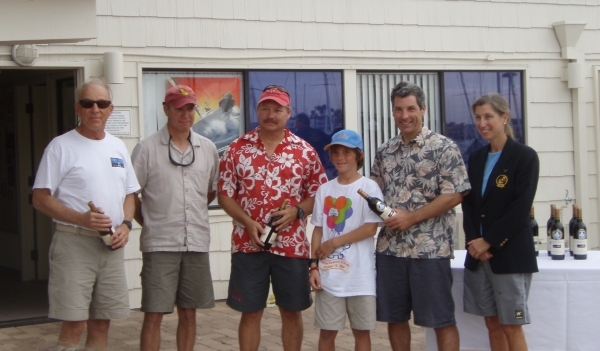 So John and Christophe won the one day CHOC regatta with a score of 1 point. And they started out the Sunkist Series with 1 point too. But that's another story that will unfold over the coming months. As always, a huge thanks to everyone that travelled far race. The series continues next month - December 6th to be exact. Racing at the Sunkist is very cordial - there's a break between races long enough to get a drink at the bar, chat a while, and then casually get back into your boat for the second race. There's always good food at the club so make a whole day of it by coming early and having breakfast (or perhaps lunch before the 1:00 start) or stay after the races and watch a stunning sunset while having dinner. The results below are for the Sunkist Series. 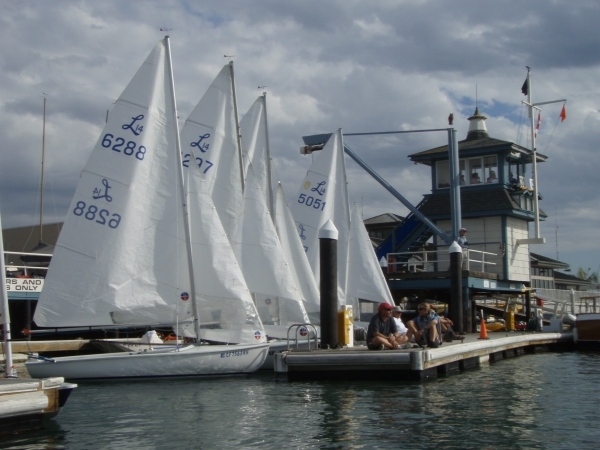 For full CHOC Regatta Results, visit the Balboa Yacht Club website.